The time has come to “free your inner chimp” and embrace the different–say hello to the compact new electric motorbike that’s set to change urban mobility forever. This is ‘Motochimp’ by Vanda Electirc, a two-wheeled zero emission joyride that puts fun and style on equal standing and promises to give city dwellers a fresh perspective on transportation. It’s also fast-chargeable (under an hour) from any regular AC power plug, and can convey you around 60 km (37 miles) when it’s fully juiced up. 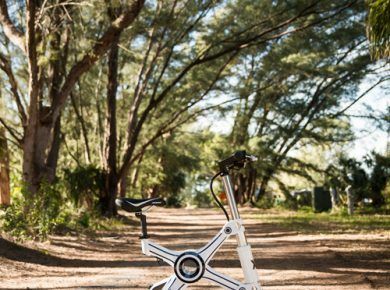 The 48V 350W electric rear hub motor draws its might from a lithium-ion battery, and can comfortably accelerate the Motochimp at cruising speeds of 30 km/h (18 mph). Its design was inspired by a sketch made by a 10-year old girl, and it looks more compact than a suitcase on wheels . 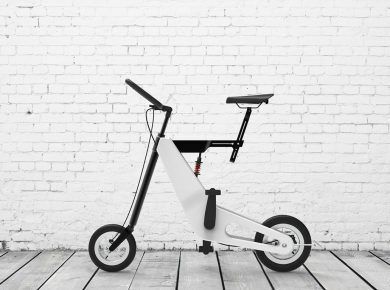 The main body is crafted out of aluminum, it can be configured in a variety of colors, and it has a 750mm wheelbase – making it the perfect for tight squeezes. It also features a wide array of interesting bits and bobs, including a AC power plug that fits under the seat, and a contactless digital ignition lock. Prices start from $2,000, and the contraption will go on sale first in Japan, followed by Asia, UK, and Europe.